Libya needs a leader with “high-level military experience” to govern it, He said giving examples of senior military leaders that have ruled Western nations. He also mentioned the most recent example in North Africa, that of President Sisi of Egypt. but makes it clear that priority should be given to security, political and social stability. Haftar has refused to recognize the UN-backed Government of National Accord (GNA) and claimed that illegal migration to Europe from the Libyan shores highlights the “absence of state authority” in Tripoli. He alleged that the Libyan capital has been “hijacked” by armed gangs and accused Islamist factions there of creating the disorder. GNA Prime minister-designate is presently in Paris where he met President Francois Hollande. The French President renewed his government’s support to the GNA in hunting down and neutralizing terrorist groups in Libya. Meanwhile, reports have emerged that Haftar has requested weapons from Moscow and an official, familiar with the dossier, said there was a meeting between Libya’s Ambassador to Saudi Arabia Abdel Basset Badri, who also doubles as Haftar’s special representative, and Russian Deputy Foreign Minister Mikhail Bogdanov. The source stated that during the ambassador’s one-day visit to Moscow on Tuesday, he discussed with Bogdanov the issue of lifting the embargo on arms supplies. 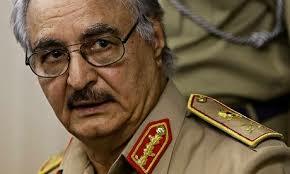 “Libyans are asking us to send them small arms, but also equipment, including planes. Also, they asked Moscow to start an anti-Islamist military operation in Libya that is similar to the one in Syria,” the source said. Haftar visited Russia in June and made similar requests during discussions with Russian Defense Minister Sergei Shoigu and Russia’s Security Council Secretary Nikolai Patrushev. The Libyan Field Marshall also wants the UN to lift the arms embargo on the country and to help it neutralize the “huge quantities” of mines left behind by the Islamic State in freed residential areas. Written by: Peter Mulvany on September 28, 2016. Posted by Peter Mulvany on Sep 28 2016. Filed under Headlines, World News. You can follow any responses to this entry through the RSS 2.0. Both comments and pings are currently closed.